Donald Land is an action game developed for the Famicom and published by Data East in Japan on January 29, 1988. 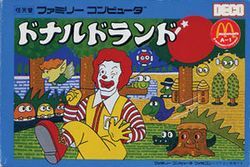 It is an action game starring the kid-friendly characters that McDonalds used to heavily promote their fast food chains throughout the 80s. It is titled "Donald Land" due to the fact that the famous clown mascot Ronald McDonald is actually known as Donald McDonald in Japan. Unlike M.C. Kids, this game is simply a generic platformer without any puzzle elements to it whatsoever. The objective is to bring peace to Donald's magical land by directing him through each of the twelve stages. Most of Donald's companions have been kidnapped, and the animals have turned feral. His brainwashed companions will occasionally attack. Donald can defend himself using apple bombs, thrown in a parabola. Being hit by the enemy causes damage, which decreases Donald's "Life" meter. During various parts of a stage, hamburger panels may be collected, as a form of currency which may be exchanged for items or a chance to play bonus games after each stage's boss has been defeated. This page was last edited on 10 January 2012, at 20:49.